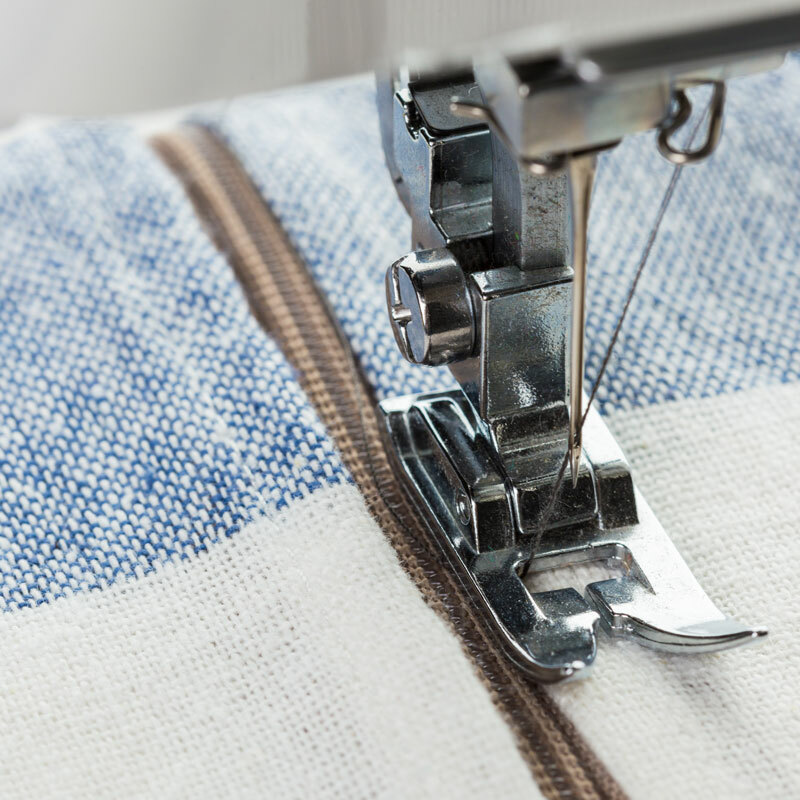 If you’re looking for the best heavy duty sewing machine, whether it’s for sewing thick materials or for more frequent commercial use, this list will hopefully get you on the right track! You can also check out my outline of what is the best sewing machine for beginner sewers as well as the best sewing machine for quilting. Disclosure: this post contains affiliate links. A heavy duty sewing machine basically means that instead of a cheap, lightweight plastic frame (which can be good if you’re looking to save or if you need it to be portable), you’re getting a sturdier metal or part-metal frame, that weighs more. You’re also looking at machines that can sew heavier materials. If you’re looking to sew primarily leather, you’ll want to check out my list of the best sewing machine for leather. Not all heavy duty machines perform well on heavy materials – I left the under-performers off this list. For leather, you’ll also need a unique set of features due to the qualities of that material, so check out the list I linked above for that. Heavy duty sewing machines aren’t necessarily industrial. I do plan to create more sewing machine lists in the future for industrial machines, however, for now I’m focusing on the best heavy duty sewing machine, judging by weight, stability, and ability to sew heavier fabrics. The Singer 4452 is just heavy duty enough to qualify for the heavy duty category, and is priced accordingly. This budget find is perfect for those who need an entry-level heavy duty sewing machine and don’t want to break the bank. This machine isn’t the best – it’s not so feature rich, and if you don’t need heavy duty, I’d recommend getting a machine at the same price point with more of the features you need. However, if this is the budget you have, and heavy-duty is a must, this is the most affordable pick. The Janome HD3000 far surpasses the Singer 4452 in weight. It’s got more features but isn’t an industrial machine. It’s heavy duty enough to cut through tougher fabric and is a smooth-running, reliable machine. This machine is a mechanical machine – not computerized. It features one-step buttonhole, an easy built-in needle threader, a hard cover, and more bonus accessories. It’s actually a really solid, great sewing machine for many purposes, and at under $500 (as this post is being written) very affordable. This versatile pick had some sisters in my best sewing machines for quilting, however this combo machine is a wonderful heavy-duty pick too! If you’re a sewer who quilts casually and wants a machine that will do both, the Juki TL-2000Qi is perfect for you! It’s got the benefit of a long nine inch arm, which makes working with bulkier materials more efficient. The foot control has a cool thread-trimming function, and loads of features to help make heavy duty sewing a breeze beyond just a heavy duty frame! For example, it has a speed control mechanism that is operated by microcomputer for precise speed control. That allows you to sew slower and more accurately even when sewing heavy weight fabric and a few layers (as well as quilting). It includes a thread tension scale so that you can easily adjust tension for your material and thread type. Note: for the heavy duty version of this machine, make sure to choose the 7360RH-7DD model from the drop-down menu! The Consew 7360RH-7DD can sew virtually any weight of fabric and is an easy-to-use, feature rich computerized heavy duty sewing machine. It’s self-lubricating and therefore requires less maintenance. It’s a solid-investment if you want to set up a home-based sewing business and need something heavy duty and reliable. It includes a fully assembled sewing table and Servo motor. What do you think is the best heavy duty sewing machine? Comment below! Crafting tips, Crafts for Adults, Felt and Fiber Crafts. Bookmark.